Barrier islands are not particularly unusual. Study a map of the East Coast, and you’ll find them everywhere from Maine to Florida, but locals and frequent visitors know that Hatteras Island is special, and the root of its unique character can be traced to its geography. Surrounded by water, Hatteras Island is literally 30 miles into the Atlantic Ocean, and this makes for a pretty wild place to vacation. The Pamlico Sound is the largest sound, or lagoon, in the United States at 80 miles long by 15-30 miles wide. On a perfectly clear day, with binoculars, you can just make out the small distant line of the North Carolina mainland. The Pamlico Sound flows into the mainland through a system of estuaries, and forms two major rivers: the aptly named Pamlico River beginning in Washington, NC, and the 275 mile long Neuse River, forming in New Bern, NC. Despite its enormous size, the Pamlico Sound is surprisingly shallow, making it an ideal water park for small children. Many soundfront rental homes have nice step-outside-your-door access to sound beaches, or you can take a trip to one of the sound access points all along Hatteras Island, including the Salvo Day Use area with picnic tables, and Canadian Hole in between Avon and Buxton with bathrooms and showers. 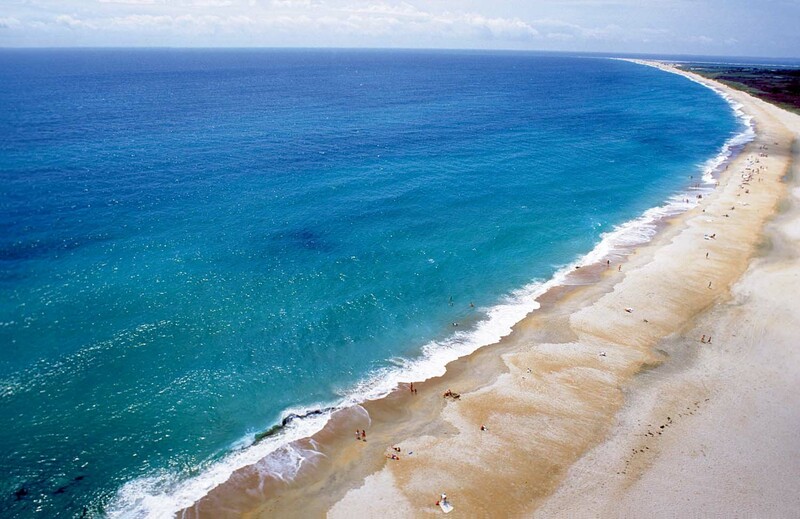 Of course, the main attraction in the beautiful blue ocean, which touches every stretch of Hatteras Island. Unlike most barrier islands, Hatteras jets off into two directions, with the portion of land north of Cape Hatteras facing the ocean directly, and the southern portion of the island facing the southeast. This means that despite changing wind or wave conditions, a certain stretch of beach will almost always be optimal for swimming, water sports, or just plain relaxing. The center of Hatteras Island, Cape Hatteras, or the precise stretch of beach known as Cape Point, is also unique in that it’s the colliding point of two major Atlantic currents, the southerly-flowing cold water Labrador Current and the northerly-flowing warm water Florida Current, or Gulf Stream. This creates turbulent waters and a large expanse of shallow sandbars extending up to 14 miles offshore. As such, Cape Point is a world renowned surf fishing spot, as large migrating species of fish meet in this particular section of the East Coast. With the island boarded by water as far as the eye can see, it’s no surprise that water often ekes its way into small canals and harbors throughout Hatteras Island, creating perfect havens for boat enthusiasts. Kayakers love the marshy estuaries and winding canals that provide wild nature tours, as well as the open water of the sound that’s ripe for exploring. Larger vessels can dock or launch from a number of public ramps, or simply choose a rental home that has its own boating access. With two inlets and an easy run to the Gulf Stream, (just 15 miles away from Hatteras Village), Hatteras Island is also home to a number of charter boats businesses. There’s a lot of character that distinguishes Hatteras Island from a typical beach community, but the backbone of its special nature is the miles and miles of water in every direction. With canals, sound access, and the big blue Atlantic, it’s easy to see why people from all walks of life, and with all perceptions of the perfect waterfront vacation, consistently choose Hatteras island as the best place to stay.